As an artist, I’m often asked questions about the men and women who are depicted in my paintings and drawings. People want to know what it’s like to be a model. Posing can range in length from a minute to several hours. Gesture poses are usually 1-5 minutes. Mid-range drawings are typically 40 minutes to an hour, and the model breaks for 5 minutes in the middle. Longer classroom poses can be up to 3 hours of one pose, with the model taking breaks as needed. Usually, the model brings a timer to set the length of the requested pose. Most classroom model stands are 8′ square platforms, elevated about a foot off of the ground, and covered in carpet. Models are responsible for bringing a sheet to cover the stand, cushions for metal chairs, and various props…including space heaters when it’s cold. I decided to go to one of my favorite models, Michael, and ask him all the tough questions. His responses are an interesting insight into his experience as an artist’s model. Karen: Why did you decide to become an artist’s model? Michael: I love being naked and staying physically fit. I thought it would be a good job for me. Karen: So, you knew nothing about art or modeling? Michael: I really didn’t know anything about modeling when I first tried it. Fortunately, during one of my first jobs at Kennesaw State University, a professor saw my desire to learn to be a good model. 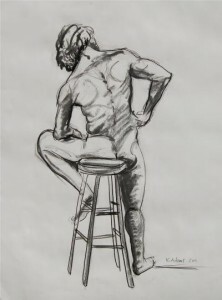 He coached me on poses, how to position myself on the model stand when the class is 360 degrees around you…drawing from every angle. Soon I began looking up art and artists. I looked at the Old Masters, DaVinci and Michangelo especially. Looking at their paintings and drawings helped me to understand about getting into poses that accentuated the muscles, or the twist of the body. Karen: You are very fit – do you have a workout routine? Michael: I’ve always been athletic; I’ve swam, wrestled, run, and was a gymnast in my younger days. I was one of those kids who just couldn’t sit still – endless energy! I do have a pretty rigid workout routine. I’m at the gym 2-3 hours a week using machines and free-weights, but most of my workout is at home. I work on my core constantly using a strengthening bar, and doing sit-ups on an incline bench…and lots of push-ups. I’m actually ‘working out’ while I’m modeling by holding poses and fighting gravity. Michael: Fat, protein, cheese, meat, yogurt – I stay away from carbs to stay leaner. My body fat is roughly 7%. Karen: But wait…I’ve seen you eating gummy bears between poses! Michael: (Laughs) Yeah, I do that to get a quick energy boost during modeling. Karen: What is some of the most unusual modeling you have done? Michael: I modeled for a photography class where they were learning about macro photography. There ware cameras all over my body, inches from my skin…that was pretty strange. I’ve also modeled as Christ laid in the tomb, a confederate soldier, and any number of warrior poses with swords. Karen: How long have you been modeling now? Karen: Have you had any injuries related to modeling? Michael: One time, I lost feeling in part of my leg for nearly 6 months. The same thing happened in my hand for a month…I almost gave up modeling then, but the feeling came back. Karen: So, how old are you? And do you see yourself modeling when you are 70? Michael: I just turned 59. I can tell there have been changes in my body in the last few years…changes related to getting older. I’ll probably still be modeling at 70, just not as frequently. Karen: Is modeling your only job? Michael: No, I have a full-time administrative position in an academic institution. I model about 20 hours a week – evenings and weekends. There was a time when free-lance modeling was all I did. I was able to support myself, but I lived frugally. Karen: What’s your advice for anyone who would like to be an artist’s model? Michael: Gestures are easy. Practice long poses at home….see if you can increase your time little by little. Concentration and dedication are key. And don’t be late to your modeling gigs…99% of your success is showing up on time. Modeling is really a lot of work to do right. If you want to do it, go for it…own it! Karen: Thanks for your insights, Michael!